Jiri (George) Havlik arrived in New Zealand, in 1999, from his native Czech Republic with just a bag of clothes and knowing two words of English, “Yes” and “No”. As a trained Pastry Chef, George worked in a variety of kitchens, but after six years of hard work in other people’s businesses, he decided it was time to venture out on his own. In 2005, George and his wife opened Bohemein Fresh Chocolates with the goal of creating chocolates that were made with high quality and fresh NZ ingredients. 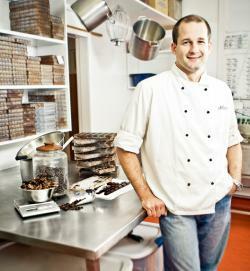 From his experiences of chocolate shop’s back home, George opened Bohemein with a simple premise, “I can do this, but I think can do it better”. The idea was simple, take great tasting ingredients and treat them with respect and integrity to retain what made them great in the first place. There is beauty in the simplicity of how we treat and make our products. The important thing is that we don’t confuse simplicity with easy. We don’t do easy, we don’t do hard, we just do it right. Great ingredients, combined with a lot of passion and the correct technique delivers great results. That’s why we believe our chocolates rival any in the world. We have the passion, technique and knowledge to take already fantastic, fresh ingredients and showcase them in our high quality couverture (chocolate). Because we are free of artificial preservatives, our fresh chocolates have a shorter than usual shelf-life, often just four weeks. You can taste the difference. We use real, natural ingredients, so you taste real flavours. When you taste strawberry in our chocolates, you’re tasting real strawberries. We believe in simplicity in both the way we make our chocolates as well as the chocolates themselves. If we make a lemon and thyme chocolate, we want people to taste: lemon; thyme; and chocolate. That’s it. We listen to our customers, they tell us what they want and like (or don’t). Fresh is Best - Taste the Difference! At Bohemein we only use Barry Callebaut Chocolate. Besides quality, consistency and availability, their sustainable practices are aligned with our ethos. To find out more. Within our own business, we waste very little. We recycle our paper and with the accuracy of what is produced, and knowledge of our ingredients and packaging, we reuse what we can. We are always looking for better ways to do things. For us the community is our business, they support us so we try to support them. We have always given back, whether it be our local schools wanting a donation for a playground, a sports team prize day or a voucher for a quiz night. Please let us know, we will try to help.